After sold out shows in the USA, Australia and Europe, the world’s favourite Liverpool-born Beatles tribute band – THE MERSEY BEATLES – are embarking on an historic UK Tour. Fewer than 80 of the 200-plus British venues The Beatles played between 1957 and 1966 remain today as so many historic dance halls and theatres that shook to the original Merseybeat sound have been demolished. In a unique bid to celebrate both The Beatles’ music and the special places that helped shape that world-changing Rock ‘n’ Roll sound, The Mersey Beatles will play 12 original Fab Four venues in October and November 2018. The Get Back Tour hits Wirral, Stockport, Whitchurch, Blackburn, Rhyl, Aldershot, Bedford, Norwich, Stoke, Coventry, Lydney, Walthamstow, Margate, Salisbury, Alloa, Aberdeen and Newcastle. 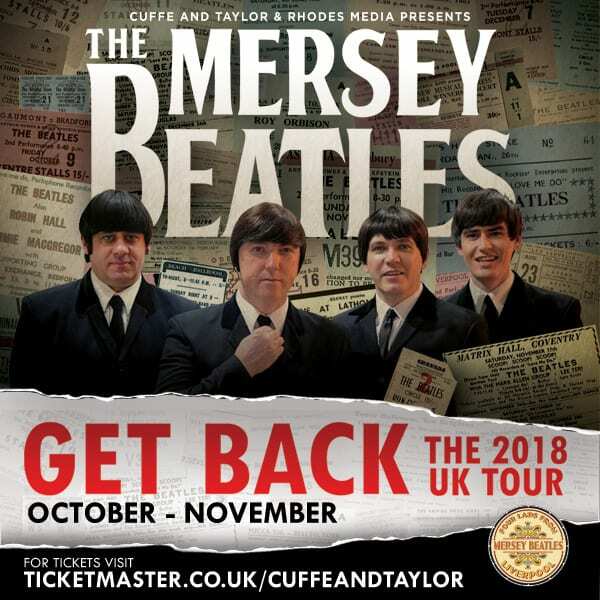 Within a stunning two-hour show – which brilliantly captures all the hits from Love Me Do to Let It Be – The Mersey Beatles will play the exact same songs John, Paul, George and Ringo did at the venue, allowing audiences to really ‘Get Back in time for a true Fab Four experience’. Ranging from town halls and ballrooms to old cinemas and theatres, the tour opens on October 31st at Port Sunlight’s historic Hulme Hall where, in 1962, Ringo Starr made his first appearance as The Beatles new drummer. Other venues include Newcastle’s Majestic Ballroom (now the O2 Academy). It was here, after a 1963 show, that John Lennon and Paul McCartney penned the worldwide smash She Loves You in a hotel around the corner. The 17-date Get Back Tour visits England, Wales and Scotland, including a show at Alloa Town Hall which, in 1960, the then ‘Silver Beetles’ played as part of their first ever professional tour – just months before they famously headed to Hamburg for the first time. When it comes to stage performance, The Mersey Beatles brilliantly exude the inner and outer spirit of the original Fab Four from the costumes, the haircuts, the instruments and, of course, that unmistakable and legendary Liverpool-born sound. Formed in 1999 in Liverpool by four school friends, The Mersey Beatles have toured the world many times over. And the band – Mark Bloor (John), Steven Howard (Paul), Craig McGown (George) and Brian Ambrose (Ringo) cannot wait to hit the road in 2018.